As a person who is not in debt and is saving hard for Retirement I am very conscious of the need to protect the purchasing power of my Retirement Investing Today Portfolio from the ravages of inflation. Once I’ve done this I then need to work out how to get a real (after inflation) return. If I am a debtor then inflation can help me as the real value of my debt becomes less as every day passes, however the opposite is true if you own assets. Additionally, in a relatively low inflation environment, like we find ourselves today, it can be easy to ignore it. In my opinion we just can’t afford to. Even a small amount of annual inflation will wreak havoc on a non inflation protected portfolio over a relatively short period of time. My chart below shows in graphical form the damage that inflation can do to your purchasing power if you don’t protect yourself from it. 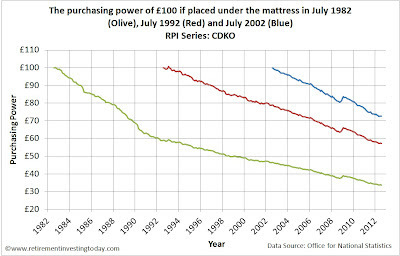 This shows the purchasing power of £100 if placed under your mattress in July 1982, July 1992 and July 2002. These are not made up numbers but instead reflect UK reality with the chart developed using the Retail Prices Index (RPI) as published by the Office for National Statistics. £100 in July 1982 only has the purchasing power of £33.82 today. £100 in July 1992 only buys £57.33 worth of 1992 goods today. 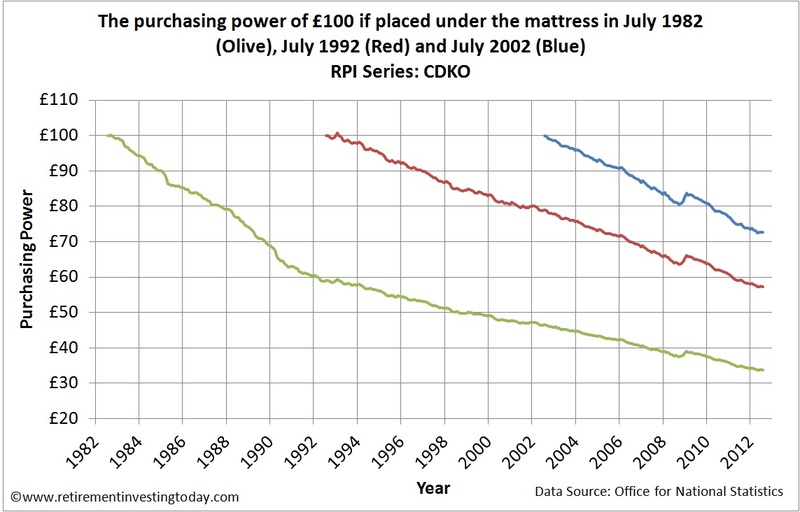 What is disturbing though is that even over a relatively short 10 year period (July 2002) purchasing power has been eroded significantly and buys only £72.65 worth of 2002 goods. As a person working towards Early Retirement in my early 40’s I may need to protect my purchasing power for 50 years or more. If my savings are not to be eroded I believe I must therefore take Inflation very seriously and protect myself wherever possible. If I position myself for inflation protection then should we end up with a deflationary environment there is a risk that my portfolio will underperform by placing all my bets on inflation. While deflation may occur I believe that our Government and Policy Makers will do everything in their power to ensure we have inflation, even to the point of currency destruction. Why do I believe this? Example 1. History. 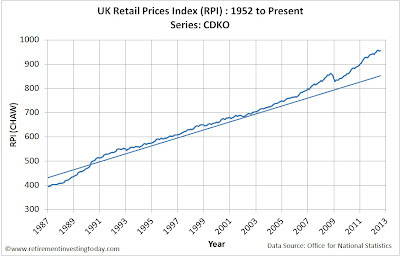 The chart below shows how the Retail Prices Index (RPI) inflation measure has changed in the last 60 years. While there have been periods of deflation, including the last few months, over the long term the trend is very much one of inflation. Example 2. Inflation steals from savers and helps debtors. Who is the biggest debtor in the UK today? The UK Government. So why would they want deflation? Example 3. You can’t tax deflation. Inflation provides a brilliant opportunity for the UK Government to steal earnings and investments through taxation that can’t occur in a deflationary environment. The brilliant thing about is that the vast majority of people don’t even know it is occurring. Let’s say you have nominally £10,000 worth of assets which over a few years due to inflation only increases to be worth a nominal £11,000. You may as an individual then have to pay either £180 (18% Capital Gains Tax) or £280 (28% Capital Gains Tax) to the Government depending on your tax band (ignoring Tax Free Allowances for Capital Gains Tax) were you to dispose of this asset. This means that in Real (ie maintaining purchasing power) terms you are actually going backwards. What about if we were to see deflation and those assets become worth a nominal £9,000? In this instance the Government gets nothing and your purchasing power is maintained. Example 4. Do as I do and not as I say. The Bank of England says that they set interest rates to keep inflation low to preserve the value of your money. Their Monetary Policy Framework tells us that “The Bank’s monetary policy objective is to deliver price stability – low inflation – and, subject to that, to support the Government’s economic objectives including those for growth and employment. Price stability is defined by the Government’s inflation target of 2%.” So that’s what they say now what do they do. Well inflation has now been above their 2% target since December 2009. Additionally, while telling us they will keep inflation low to preserve our money behind the scenes in their own pension fund (the table below) they have at least 94.7% of their assets protected from inflation. 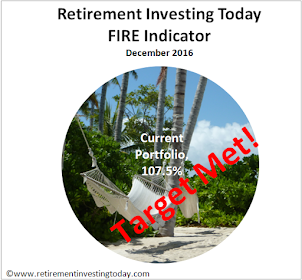 The Retirement Investing Today portfolio is based on a fairly typical asset allocation model which I have then slightly modified to suit my own needs and to try and squeeze some extra performance. This is how I built my original portfolio. The basic two building blocks chosen were “high risk” equities and “low risk” bonds. Within the equities portion I feel by default that I am reasonably well protected with equities (companies over the long term should be able to raise prices in line with inflation), property (rent should be able to be raised in line with inflation) and possibly even my commodities holding (now only gold) protecting me from inflation. It is the “low risk” bonds portion where I had to do some thinking to protect myself from inflation. A traditional portfolio would probably likely hold Corporate Bonds and/or Government Gilts plus an Emergency Fund of Cash. I’m no different with an Emergency Fund of Cash which I know is being eroded by inflation. Where I do differ is that I no longer hold any Corporate Bonds or Government Gilts. Instead the remainder of this portion of my portfolio is built up using NS&I Index Linked Savings Certificates and UK Index Linked Gilts. UK Index Linked Gilts are issued by the UK Government. The way that they operate is that, unlike traditional Government Gilts, both your capital value and the interest paid are linked to the Retail Prices Index (RPI). Let’s run a very simple example. Let’s say you buy £1,000 worth of a 10 year Index Linked Gilt which pays a coupon of 0.5% (the yield after inflation which is quoted in the title of the gilt). If inflation is 3% over that 10 year period then when the bond matures the Government would hand you £1,344 (=£1,000x(1+3%)^10 or =£1,000x(RPI At End of Period)/(RPI at Start of Period)) back. Your 0.5% coupon which is also paid during the time you own the bond will also pay you 0.25% of the increased capital amount every 6 months ((=0.5%/2)x((RPI at Coupon Date)/(RPI at Start of Period))). They are actually more complex than this as there are lags of either 3 or 8 months over which inflation is calculated, rounding conventions you should be aware of plus an order more complexity appears if you buy a gilt already in issuance or sell before maturity to name just a few items of complexity. If you are interested in UK Index Linked Gilts I urge you to really understand how these work to avoid disappointment. A good starting point would be the fantastic book by Tim Hale : Smarter Investing Simpler Decisions for Better Results and the UK Debt Management Office (DMO) website. Of course Index Linked Gilts could lose out when compared to other Bonds or other “low risk” investments. Only history will tell what was the best choice. In the meantime on Thursday I converted 0.8% of my total portfolio value from cash to Linkers to bring my total holding to 3.3%. This may not sound like much but over the coming months and years I expect this to grow quickly as both my NS&I Index Linked Savings Certificates begin maturing after their reinvestment period in October 2013 plus I continue to save at a very high rate with no opportunity to invest in new NS&I issues. - With my Sippdeal SIPP I have access to Vanguard funds and so buy the Income variant of the Vanguard UK Inflation-Linked Gilt Index Fund which has a TER of 0.15% and a Purchase Cost of 0.20%. - Within my TD Direct ISA I don’t have access to Vanguard and so buy the iShares Barclays Capital £ Index-Linked Gilts (INXG) which has a TER of 0.25%. How are you protecting yourself from inflation? Are you protecting yourself from inflation? Do you think we will see inflation or deflation? I welcome answers to these questions or any comments to help us all learn below. Thanks for highlighting the potential premium risk associated with Index Linked Gilts if buying at this time. It's always difficult in these posts to know how far to go before readers glaze over. This one was more than twice the length of what I prefer to publish and already had started to descend into quite technical detail so I stopped. My problem at the moment is two fold. The first is that I struggle to value these things. I don't have a PE10 style mechanical valuation system sorted out so I just buy, hold and rebalance at the moment. So while I agree that I might have paid a big premium the market has responded by giving me a return of more than 1% in less than a week. Of course I acknowledge it could fall 1% or more tomorrow. I just don't know so stay strategic. The second is what else do I buy to protect myself from inflation. I agree with your conclusion that I might see a drag on return however what else can I buy. There is just nothing else that I can find that's suitable given we've lost NS&I ILSC's for at least the rest of this year. Any ideas? Might be useful information for you. I've just had one of my 3 year ILSC's mature and unfortunately the current rate for renewals is now also pretty poor at RPI+0.25% AER. I'm going to renew as I'm over a barrel with nothing better on the table. Thanks for the suggestion of Index Linked Corporate Bonds. I'm not sure I'm prepared to go to that level of risk at this point. I set my Investment Strategy a long time ago and this portion was always based around low risk Government Bonds and NS&I Certs. That said, I am going to now head off and do a little more research on these as it's always nice to have other options in the back of your mind. Thanks also for sharing your thoughts on how you value your Linkers. Quite an interesting way to think about it. I have had similar concerns about inflation protection and the premium on linkers which as a result are nothing like as good an investment as NS&I index linked certs were. I now favour buying index-linked tracker funds (Vanguard / iShares) regularly. Although they clearly behave slightly differently in a portfolio to individual index-linked gilts, the tracker funds offer quite a few advantages in my view: simplicity, automatic re-investment of coupons, liquidity and no worries about bid-offer spreads. In 'normal' inflationary environments over the longish-term there should be little difference in return from index-linked gilts - sometimes inflation will be higher than market expectations (index linked gilts win) - sometimes inflation will be lower than market expectations (normal gilts win). However, the real reason I want to have index linked gilts in my portfolio is to protect against the tail risk of a significant period of unexpected run-away high inflation - say 5-10% for 10 years. Because of my concerns about this tail risk of unexpected inflation I am prepared to pay a bit of a premium for index linked gilts at the moment. I am happy to carry the opportunity cost of not being in equities in return for the peace of mind index-linked gilts give. I see this investment strategy in a similar light to buying travel insurance. For run of the mill travel losses (stolen camera etc) there isn't much point in travel insurance (over a few years the premiums will cost more than a replacement camera). But for the tail risk of having a serious road accident etc, which might wipe you out financially, travel insurance is well worth the premiums. So it is with inflation linked gilts in my view - the most important benefit they give is protection against tail-risk sustained unexpectedly high inflation. (1)There is a good paper on the Vanguard UK site and it is interesting to note that their Life Strategy funds (which I favour) have a significant weighting of their fixed interest towards index-linked gilts. (2) http://www.fixedincomeinvestor.co.uk/ Loads of excellent information on index linked gilts and index linked corporate bonds in the retail market. Thanks for engaging. An interesting view which adds real meat to the post and contributions so far. Particularly the tail risk protection. I'd be interested to know, given it sounds like almost an insurance policy for you, if all your low risk investments are Linkers or whether you are also buying corporate bonds and normal government gilts? I too get my Linkers from Vanguard and iShares. With the loss of NS&I I too will now be a regular buyer of Linkers. Thanks also for the two references. In 'normal' inflationary environments over the longish-term there should be little difference in the return from normal and index-linked gilts - sometimes inflation will be higher than market expectations (index linked gilts win) - sometimes inflation will be lower than market expectations (normal gilts win). Thanks for your kind comments RIT. I now have about 30% of my total portfolio in index-linked investments which is a bit higher than I want in the long run. Going forward I am splitting my fixed income investments more or less 1/3 each linkers, corporate bonds and gilts. I now mainly use the Vanguard Lifestrategy Funds with a bit of ishares SGIL (which is 25% UK : 75% international) and Legal and General LGASI (non-availability of Vanguard on the platform). I quite like the idea of foreign index linked bonds for lower correlation. I also reason that if inflation in the UK was significantly higher than abroad then SGIL would still perform well because of favourable currency movements. A while ago foreign index linked securities were at a lower premium than linkers but this might have changed. I am around 10 years from retirement and will probably aim eventually to have 30-40% of my fixed income in linkers. For obvious reasons I am particularly wary of gilts at the moment but for the long-term it probably makes sense to raise allocation slowly. I should say that I am not a professional investor. I am merely a self-taught (numerate! ) private investor who had the good fortune to discover low-cost passive investing some time ago. This is the Vanguard doc which may of interest to others. Thanks for sharing. From your numbers it looks like about 45% of your total portfolio is in bonds (of all flavours) plus NS&I. That's a lot higher than my 22%. Given you say you are 10 years from retirement and targeting a lower allocation to bonds then I'm guessing you are playing a far higher tactical allocation game than I am? Are you having success with that? Do you have a mechanical system in pace that you would share? The theory says that by having a mix of linkers and traditional bonds that you should be able to get a bit of a free performance lunch as part of a portfolio. This is because linkers have a high correlation to inflation and convential bonds should fare badly with higher inflation. Is that why you have a higher allocation to linkers and NS&I? Or have you just bought more of those and just seen all rising in value equally as yields are driven down by QE etc? Don't worry that you are not a professional investor. I'm not either. Retirement Investing Today is a place for learning and it's engagement like this that makes us all better investors. Happy to share and it is helpful to focus my mind. I am not really being as tactical as it seems (no system) although I madea one-off decision to avoid normal gilts 4 years ago (see below). Aside from a significant cash cushion (covering several years of liabilities) I aim to be consistently around 50:50 equities : fixed income, going forward. My decision to avoid normal gilts was made 4 years ago and I framed it as a risk management decision. Returns on cash weren’t too bad and although gilt yields were low I didn’t think they would fall so much. Obviously I missed out on some gains from further yield falls. However, now of course in the view of many, normal gilts are an accident waiting to happen (see William Bernstein and others). On a 10-15 year horizon I want about a third of fixed income in normal gilts so I am just trickling in very slowly. 1. You never really know your own risk tolerance until you have invested during a market slump - one of my asset allocation rules now is to keep an eye on the equity sum to make sure I will be able to sleep at night if there is a 50% stock market fall. 3. As you get nearer your investment goal, wealth preservation becomes very important. I worry more now about the low probability tail risks of potentially very serious events. As with my comments on Linker I view a lot of investment decisions now in risk-management terms. 5. In a crash diversification falls massively. 6. Costs are even more important than I always thought and are much higher than TER for many actively managed funds. 7. I made the same mistake as you regarding commodity ETNs and contango (not to mention counterparty risk). I now only invest in instruments I fully understand. 8. Tracking error is the most important metric for tracker funds. The Fidelity UKMBI has a TER of around 0.3% but a tracking error more like 0.7%. Vanguard tracking errors are significantly lower. ( I try not to worry about stock lending counter party risk!). 5. In a crash correlation between many asset classes rises dramatically. Therefore the benefits of diversification are lower than hoped for when they are most needed. Interesting that you're sitting on a lot of cash. I'm only carrying 6.1% of portfolio value in cash. Rationale here is that the real return is just so very negative after tax that in the long term I will just lose too much. I guess what I'm saying is that I'm seeing to much risk (of under performance)in cash today. Interesting the different responses people feel during market down turns depending on age, future earnings potential, family situation etc. In contrast during the last downturn I was seeing portfolio value fall quickly but was also replacing the falls very quickly with cash earned (high savings rate). The mistake I made was that I was sitting on the sidelines looking for US PE10's to go into single digits before piling in boots and all. That didn't happen so while I invested during the down turn I tried to market time and lost out compared with what the strategy I run today would have yielded. 2. I'll have a look at your ebook recommendation as up until now I've stayed away from cash other than a good healthy emergency fund. Part of that was driven by NS&I Certs being readily available but also that it pains me to be robbed blind by banks (low interest rates) and government (inflation) in broad daylight. 3. Agree with you on wealth preservation. Not sure if you saw my post on the various retirement options people face. 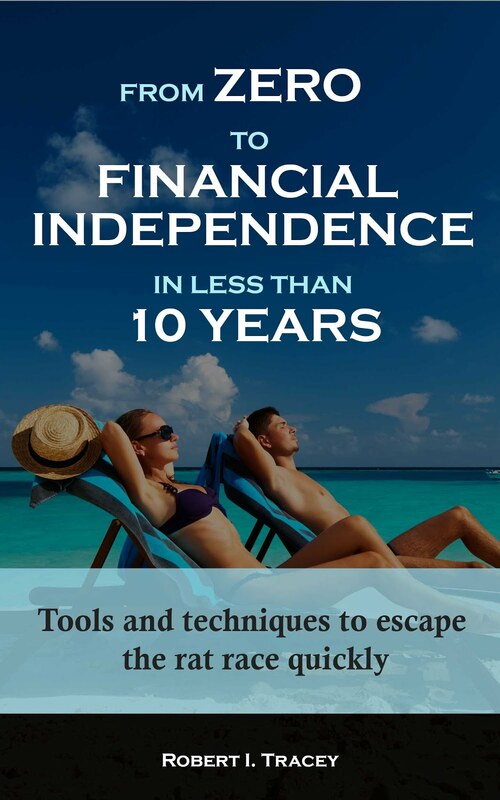 If not it's here http://www.retirementinvestingtoday.com/2012/08/early-retirement-extreme-vs-early.html . The chart towards the bottom of the post is IMO the key story. As I am saving a lot of money in a very short time, to enable Early Retirement, the maths shows that chasing return is not nearly as important as someone who saves little but intends to retire in many years where the desperately need that compound interest effect to make it work. It is preservation of assets that are key for the person saving heavily. I feel I have the risk/return balance reasonably ok for my current status with expectations of 4.2% real returns going forward. I'm also derisking further (albeit very slowly) by moving 1% of allocation from high risk to low risk annually. I have to be very careful though not to swing to far or I won't get sufficient return for my retirement period. 4. I too am a fan of Vanguard and hold a few of their funds. I've now made my complete strategy unemotional and mechanical to avoid any psychological effects. This includes when to rebalance. I must say, so far it is working but has made the investment process quite dull. I'm glad I have this blog to keep me amused :-) (It's main purpose is to keep me accountable and on the straight and narrow). 8. Agree with you on tracking error. I'm no longer running any synthetic ETF's (that I'm aware of) and have choices which track my chosen indices well. Thanks again for the healthy discussion. interesting to read your comments re asset allocation and bonds. I tried to do some back testing over two periods: 2007-2012 to test against a crash and 2000-2012 to include the prior bull market. For each model I withdrew 4% yearly adjusted for inflation. I also notice that many "bucket" pension plans allow 2 years' living costs worth of cash and 3 of bonds with the idea that one could live for 5 years without touching one's equities in a bear market thus giving them time to recover value. I also modelled a Sharpe "Lockbox" plan and to make it work found that I needed a portfolio of about 60% index-linked bonds with the rest equities.